What do you think of when you hear the word ‘hobby’? An official definition declares a hobby to be “any activity done regularly in one’s leisure time for pleasure”. So in that sense, building highly modified cars and then pitching them sideways is most certainly a hobby. But what about the more-focused take on the term used in the word “hobby shop”? You know, the kind of place that’s filled with model rockets, RC cars, and scale airplanes. The car you see here is one that combines both takes on the word into one extremely creative and positively awesome automobile. 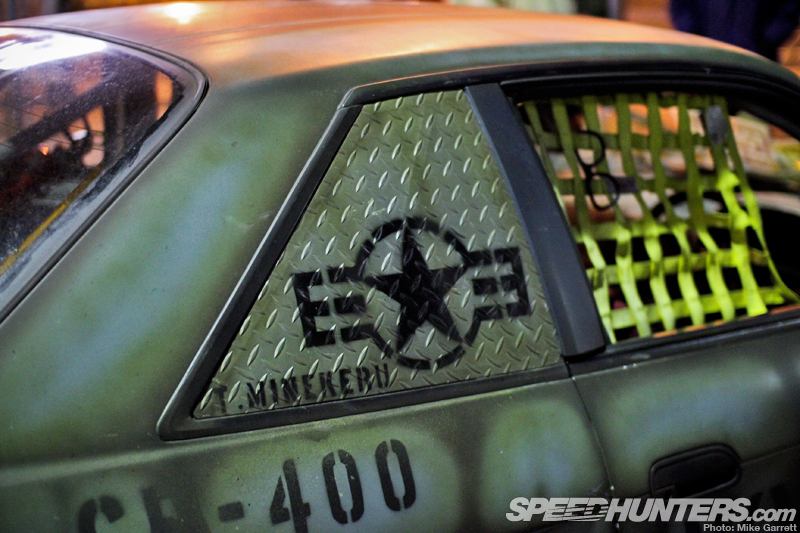 It’s all the work of Mr. Takashi Mine from the Japanese city of Kobe, and the result is a mix of his current passion for building and driving drift cars, and his childhood love of military aircraft. 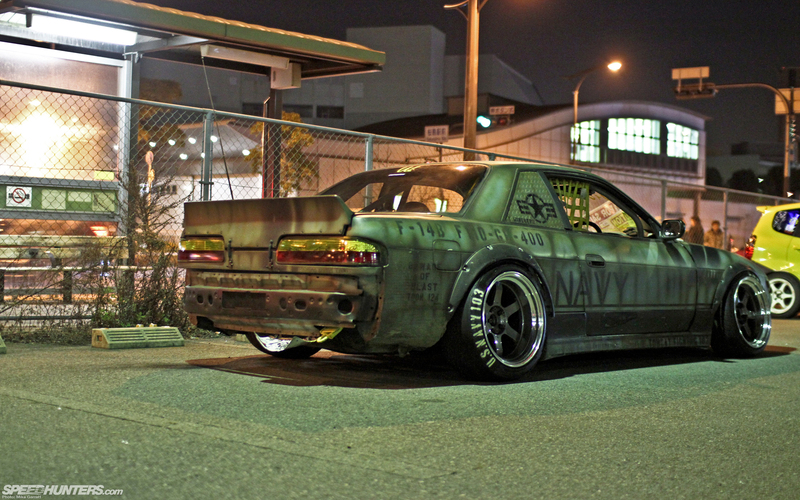 Mine-san’s Silvia is not the first military-themed drift car to come out of Japan. In fact, his decision to go with the military motif was heavily influenced by his friend Satomi Nakatwatase, the builder of the Panzer-themed S14 that’s popped up on Speedhunters a few times in the past. 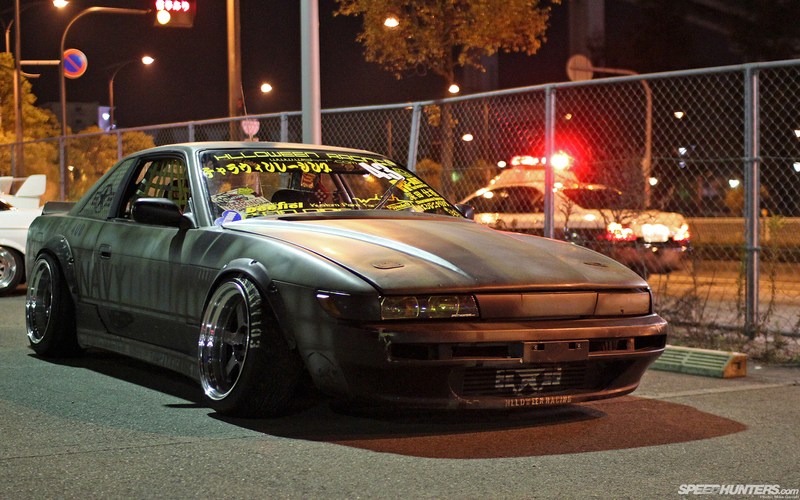 In that sense, you can imagine Mine-san’s ‘Tomcat’ S13 as one vehicle in an elite unit of battle-ready drift cars. The US Navy jet fighter theme was an easy one for Mine-san. 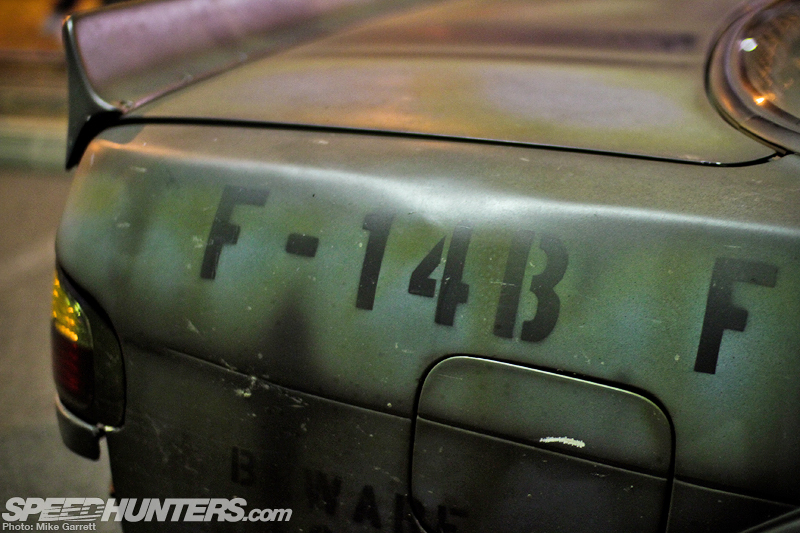 From an early age he became obsessed with military aircraft and the F14 Tomcat is his all-time favorite. Like many of us, he also put together plastic models of the jet that became world famous as the ride of Maverick and Goose in the ’80s blockbuster Top Gun. I could probably write this whole story with lines from the movie, but I’ll spare you that. Besides the obvious Top Gun connection, you also have to remember that Japan has a particularly strong connection to the F14 due to the long-standing US Navy presence in the country. 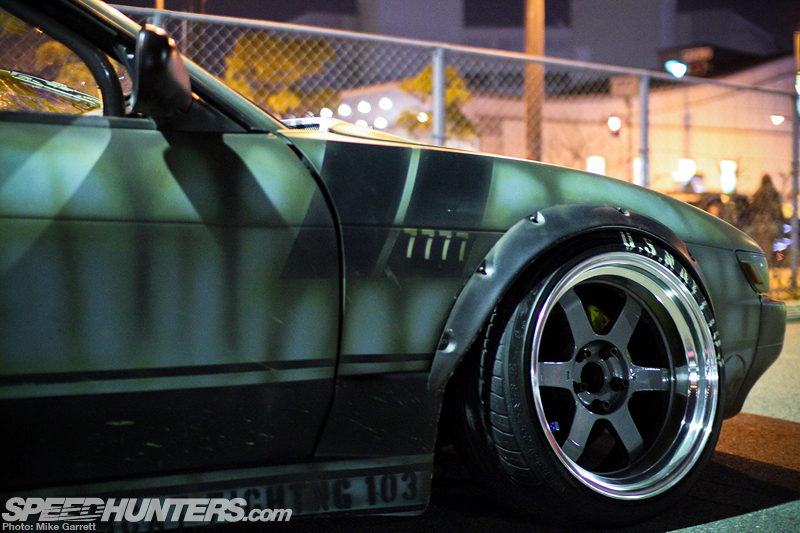 If Mine-san’s S13 looks crazy in photographs, it looks even crazier in person. 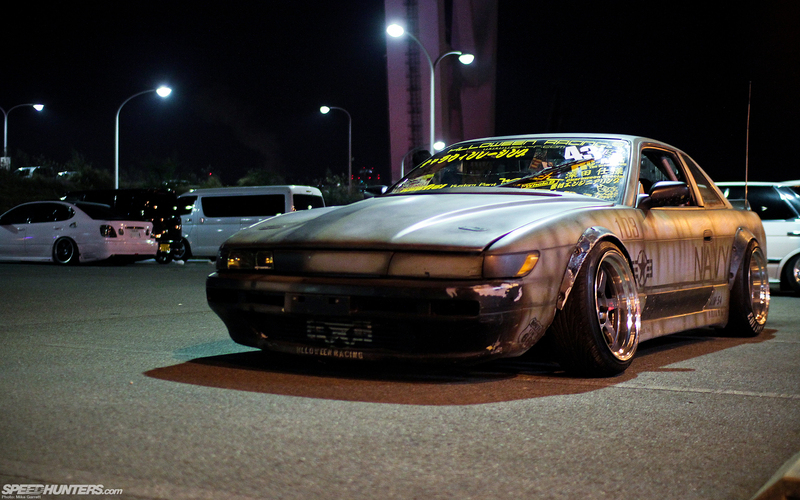 When I saw the car at the M&L Party in Osaka earlier in the year, I was blown away. 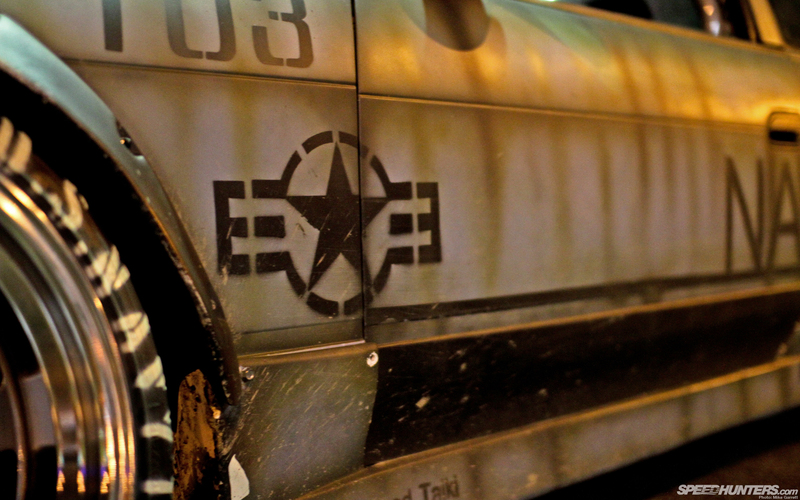 There are lots of cars out there built with a military theme, but few have this combination of both detail and style. Perhaps the most striking element of the car is the paintwork, executed by an outfit known as Painting Squad Taiki. 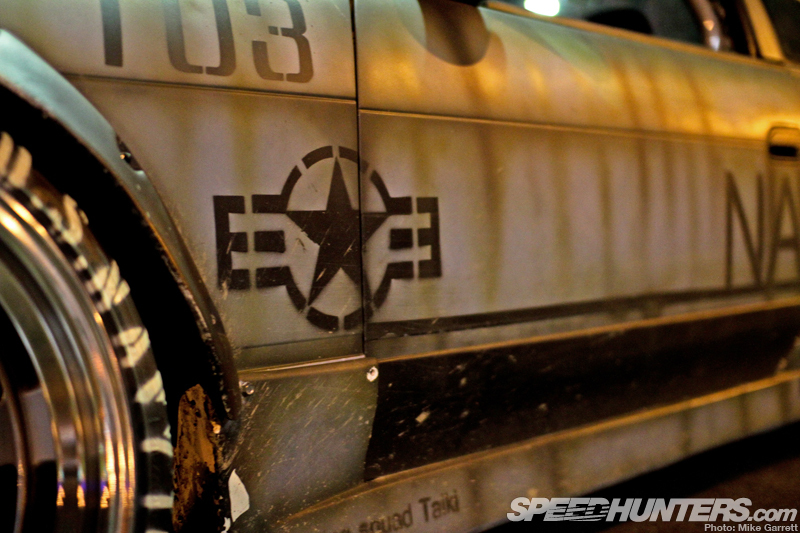 Not only has the car’s body been coated with colors and markings similar to what you’d find on a Tomcat, but it’s also been weathered for a battle-hardened vibe. Again, this a technique that also carries over from scale modeling where military vehicles are made to look dirty and used for a more authentic look. 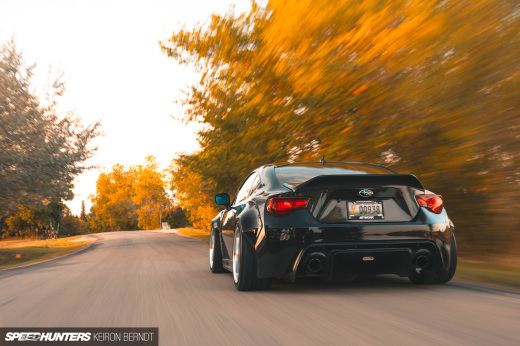 Besides the combat-spec paintwork, the car exterior of the car has also been outfitted with a choice selection of body modifications that also lend to the tough and ready look. 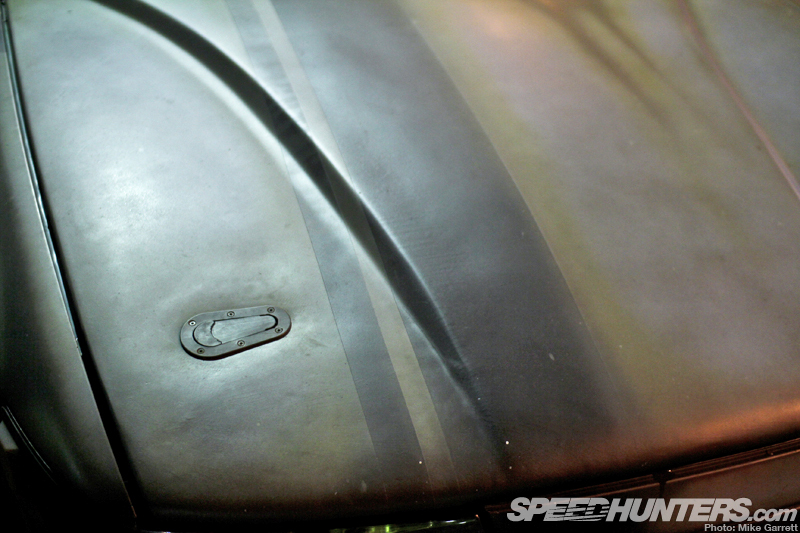 The locks on the Origin Type II hood for example look like something that might be used for jet fighter maintenance. 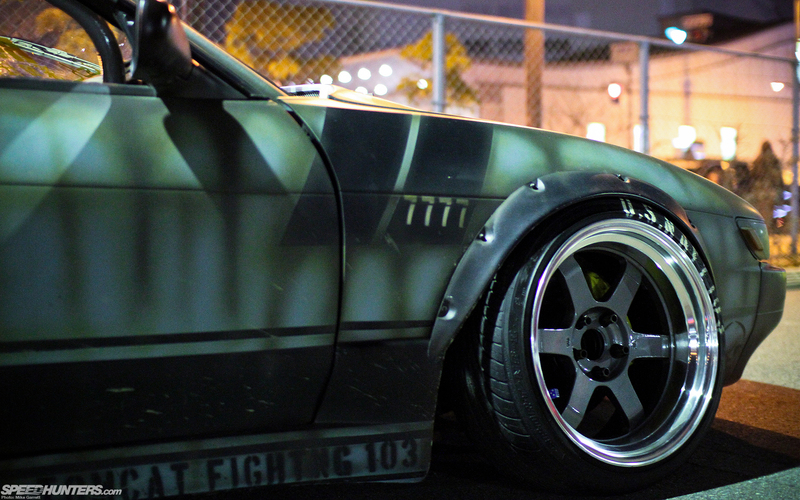 The over-fenders were originally made for a 240Z, and I have to say that this one of the only times when beat up, shredded fiberglass has actually added to a car’s look. 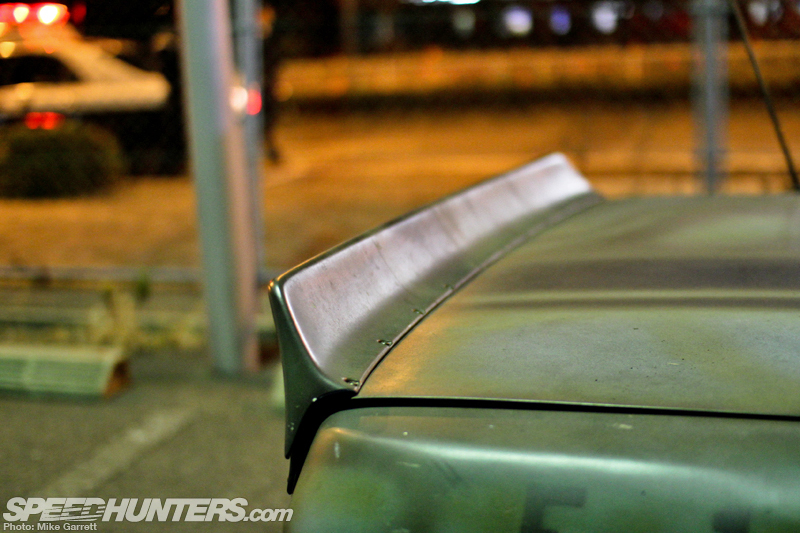 Out back, the rear bumper has been left off completely for a stripped down look and a TRA Kyoto 6666 ducktail spoiler has been added to the decklid for just the right amount of style. Other creative touches include diamond plate quater window panels ostenciled with the American military insignia. 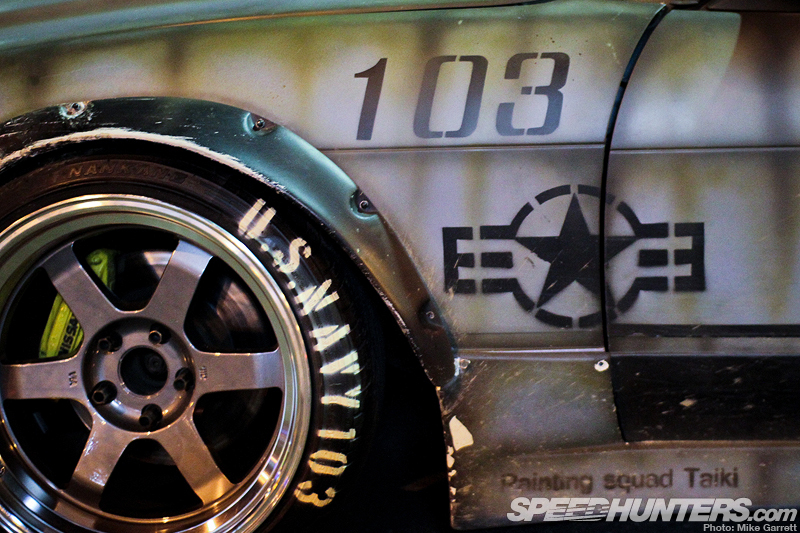 The car also carries the markings of the Navy’s famous VFA103 ‘Jolly Roger’ fighter squadron. 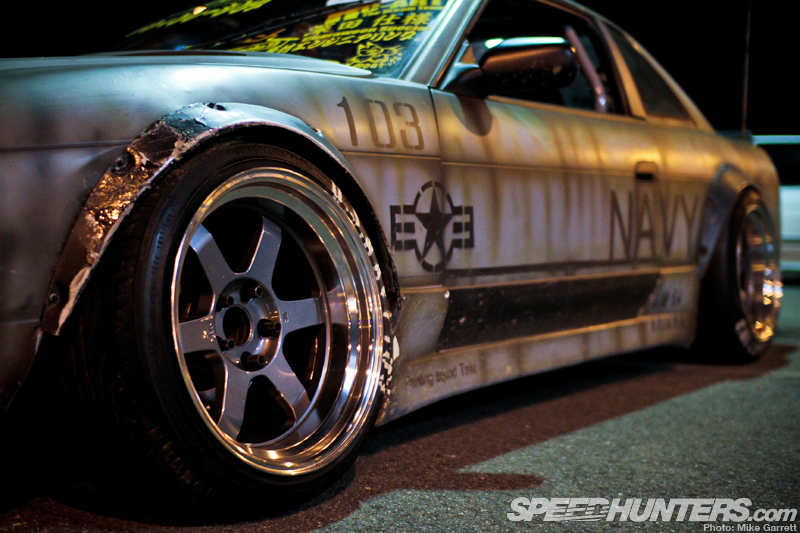 And while it’s the car’s unique style that gets people talking, it’s important not to overlook the fact that beneath the military exterior lies a fully functional and completely dialed-in drift car. 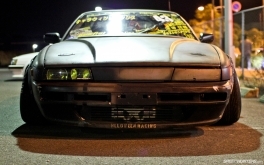 Mine-san is actually a member of HLLOWEEN RACING, one of the area’s most well known drift teams, and the car gets driven regularly at places like Meihan Sportsland and Suzuka Twin Circuit. Although the car began life as a naturally-aspirated Q’s model Silvia, the N/A motor has been replaced with a proven SR20DET setup, with all the work undertaken at a local shop called Nishimura Engineering. 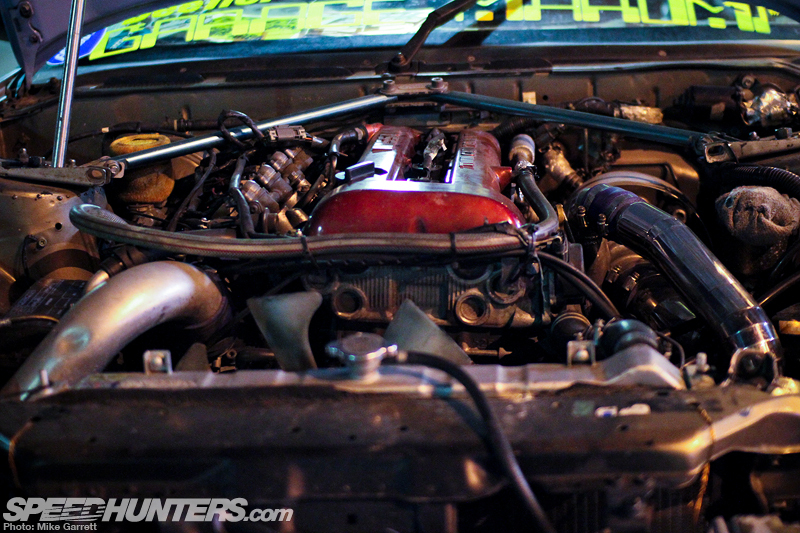 The SR is fitted with a number of upgrades, including Tomei cams and a Trust TD-06 L2 20G turbocharger. All together, the built SR is good for somewhere between 380 and 400 horsepower. 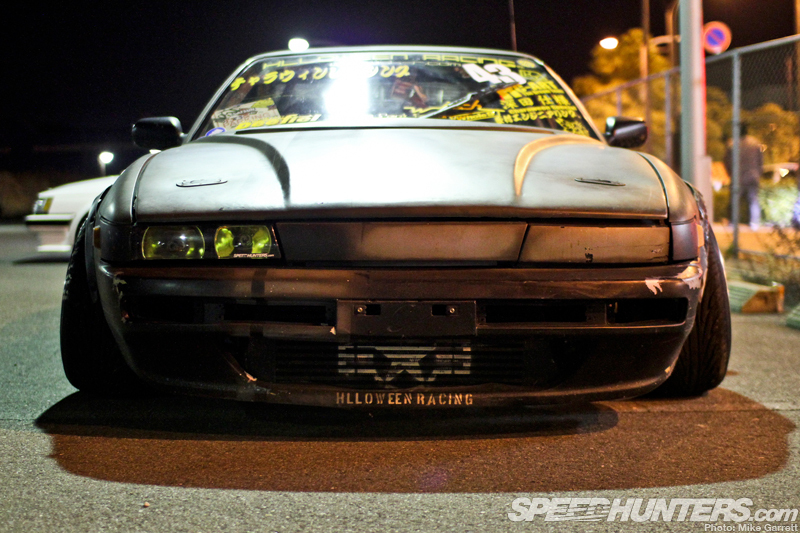 Nothing insane, but the perfect amount of power for a reliable and capable drift car that can still be driven on the street with ease. Of course, the suspension and chassis have also been completely overhauled based on Mine-san’s years of drifting experience. 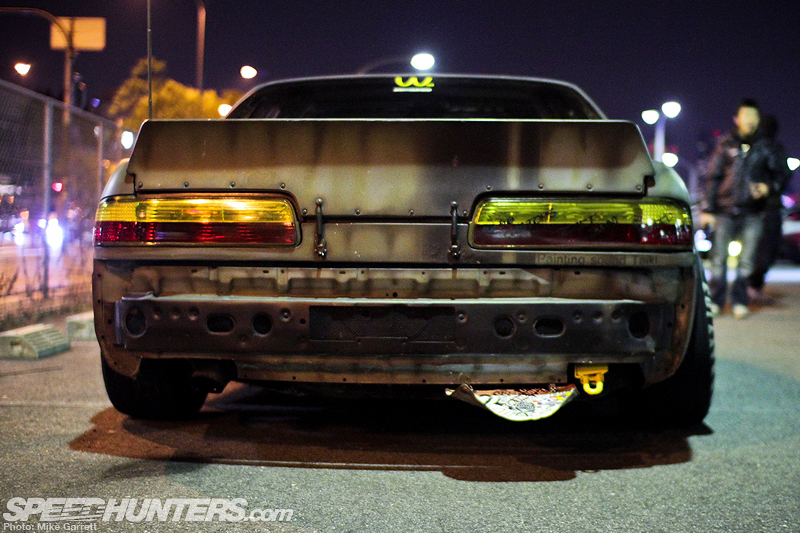 The car sits on Racing Gear coil-overs and is packing all the chassis upgrades you’d expect on a serious drift car: modified knuckles, tie rods, adjustable arms and more. 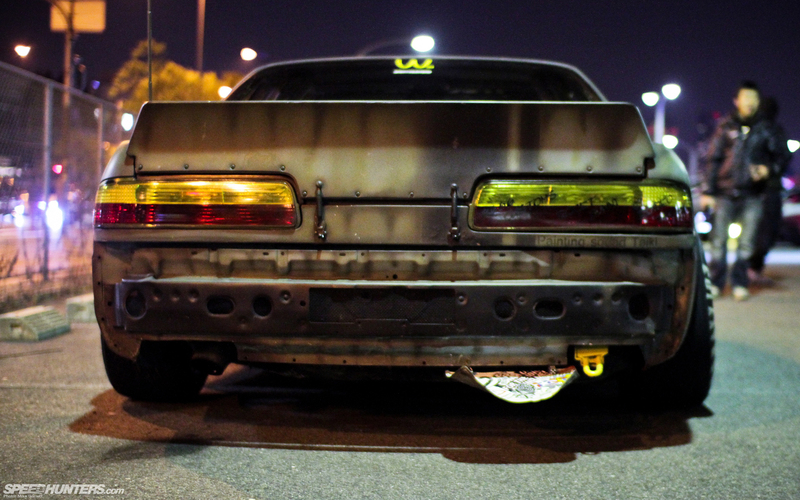 The whole body has also been spot-welded for extra strength too. Naturally, it was important to have a set of wheels that work with the jet fighter aesthetics, and I think the choice of RAYS Volk Racing TE37Vs was a good one. The wheels measure 17×9-inch -10 up front and 17×10-inch -20 in the rear, and the tires have also been lettered with ‘US Navy’ markings for another custom touch in keeping with theme. Inside the car you find a very interesting mix of both functional race car elements along with some cool style touches. First and foremost there’s a full six-point roll cage, which contrasts nicely with the dice hanging from the rear view mirror. The window net is an homage to NASCAR machines, which Mine-san is also a big fan of. 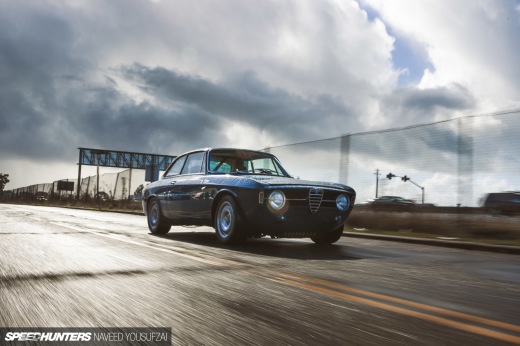 The driver’s seat is a Bride Zeta III and the 330mm Nardi Classic steering wheel – which has been used in various drift cars for eight years now – is a particularly strong memento for Mine-san. 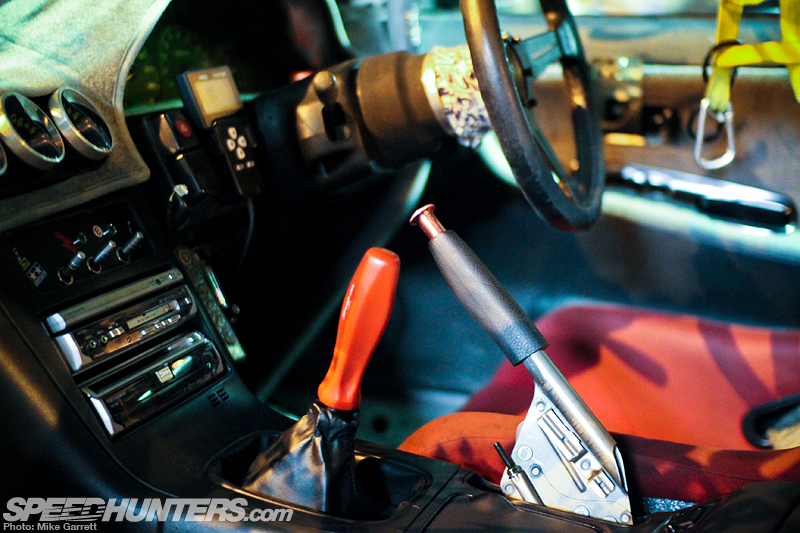 Let’s not forget one of my personal favorite parts of the interior – the Snap-On shift knob. In this shot you can also see the Defi gauges and the A’PEXi Power FC controller mounted on the steering column. The car also has a fully functioning audio system which I assume only plays Kenny Loggins and Cheap Trick. 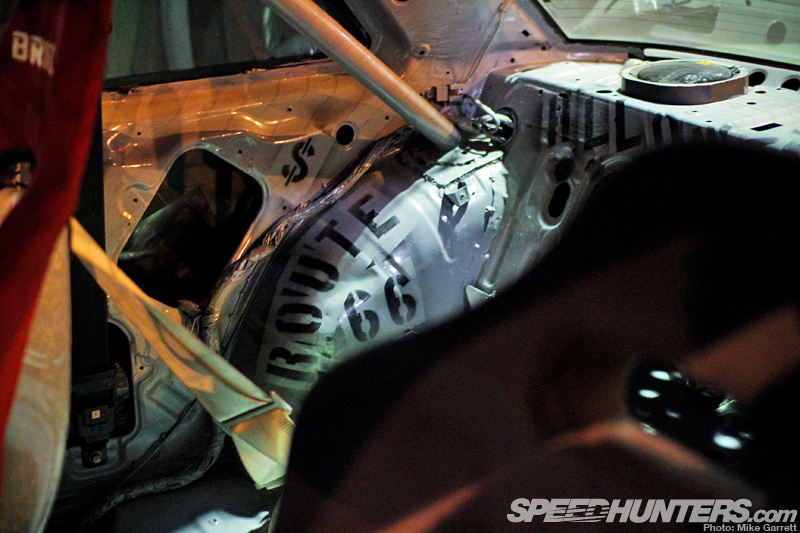 Painting Squad Taiki also applied its touch inside the car, with insignias like ‘Route 66′ and ‘HLLOWEEN RACING’ stenciled over the bare interior panels. As someone who had childhood dreams of becoming a fighter pilot and a lover of cool drift cars it’s impossible for me not to fall head over heels this car. It’s a perfect mix of style, function, and a whole lot of creativity. Unfortunately, during a recent MSC event at Bihoku Highland Mine-san crashed the Silvia during the Triple Class competition and the car has essentially been written off. 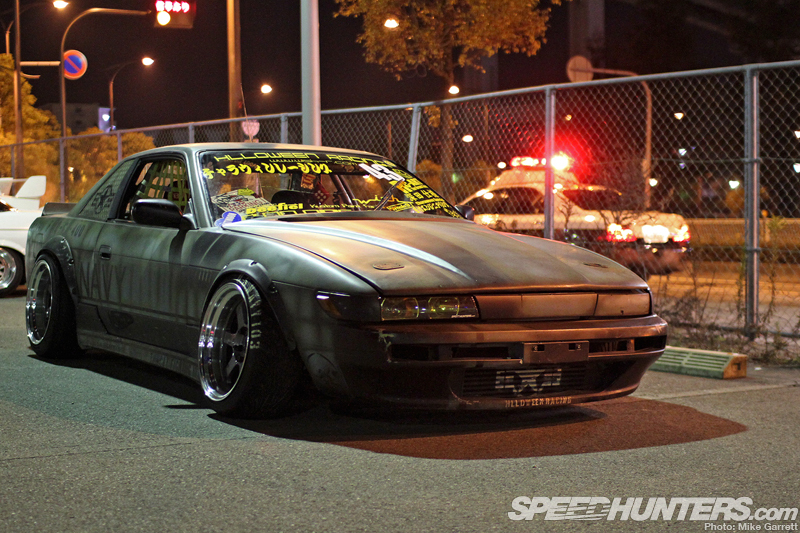 No worries though, as he tells me he’s already working on a new Silvia build that should be even cooler than this one. I don’t know a whole lot about it at this point, but he did say he’s working closely with Miura-san of TRA Kyoto on the project so I expect big things. 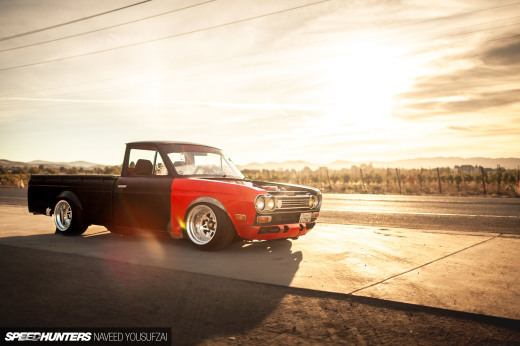 So while this car may have crashed and burned, I just want to say this: Takashi Mine, you can be my wingman anytime.